As the old saying goes, it never rains but pours. To the Netflix lovers, you may be tired of struggling with the current Netflix subscription with not much to watch. Meanwhile what makes you feel even more frustrated is that Netflix carries out higher charge recently. So whether or not you are planning to drop out from the Netflix family, it's not a bad thing to know more about the best Netflix alternative, especially the Netflix replacement for free. What if Netflix not working? Here tells you the solution. YouTube, the world biggest online video-sharing site, provides you with the best possible video experience, on which you can find out any video you like, the SD or HD (4K 4096 x 2160) movies included as well. If you are familiar with how YouTube works, you are supposed to know that YouTube are far from the monthly charge system. It means that if you don't use it for a few times per month, it's needless to worry about the service fee issue. And this finer Netflix alternative supplies you the movies with variable price, and even downright free for certain movies. And the better thing is that you can even apply a professional yet solid YouTube offline downloader to get free YouTube movies downloaded in full length. The far-famed MacX Video Converter Pro cuts the buck at this point to let you free download 4K 8K Ultra HD movies, 1080P 720P even 3D Blu Ray movies from YouTube (more video sites supported up to 1000+) with blazing fast speed so that you can free watch Netflix Hollywood movies on Mac computer offline. Better still, you can even utilize this YouTube movie downloader to convert movies to your iPhone iPad Android Samsung HTC Sony, Microsoft, Google device for on-the-move watching. Another case: In the view of your limited storage in your iPhone iPad, what if your iPhone iPad is overloaded with movies in large size? No need to be upset, here the all-encompassing Air Playit, the world eminent video streaming software can aid you to stream any movie, video audio to your Apple iPhone iPad Android device via Wi-Fi or 3G/4G network. It acts as your personal audio video cloud so that you will access to a limitless number of movies, videos and music at anywhere with all media files stored on your home PC/Mac hard drive instead of your iPhone iPad. The well-known iTunes has met with warm reception in the market and I am pretty sure, will of interest to you when it comes to streaming movies and TV shows online. Because it's designed for you to purchase everything you desire in individual rather than paying a month fee. Moreover, after you update your video to a premium level, you are going to enjoy the video content (purchased or rented) without any commercial add interruption. But frankly speaking, this best site like Netflix rides a wave of popularity due to its a large selection of music, movies and TV shows for ordering anytime. If cost doesn't matter too much, you can splurge on iTunes for costing a little bit more greenback on the latest movies, since many latest blockbusters are available on iTunes but no valid source on other Netflix alternative services. In short, in case you are going to watch the latest films on your iPhone iPad, then iTunes is your best bet. Just try not to watch too many shows and movies because the costs can add up rather quickly. Google Play is an all-round media service providing not only plentiful movies, videos, music, but also software, books, and apps. This ideal Netflix alternative functions well via cloud services, sending all of this content to Android-enabled devices and PC-based Google services. Speaking of online video streaming, it's mentionable that Google Play Movies on the PC is free to browse and for Android-based portable devices, the app is a free download. You see, each individual movie or episode of TV show is priced on its own. You can choose to rent a movie or purchase it. Choose the first one, then you need to seize time to watch it as when your rental deadline comes, you will have to pay for its rental again. And also you are only accessible to online video streaming, rather that download the movie. Once you have purchased it, you are given the right to download and transfer it to your library, hard drive for enjoyment anytime anywhere. At the end of the day, Google Play does offer a number of advantages to using their service on the PC and on any Google Android device. Assuming you are an iOS device user, it seems you have to look for other more compatible alternatives for Netflix. Reading until now, you may feel a tad puzzled why the aforementioned Netflix replacements feature movie and TV show streaming, lack in function to DVD enjoyment. Calm down! The following will show you the best Netflix alternative for DVD enjoyment. Watching Movies with Netflix Rental DVD Disc, Best Way? Not Really! It's a common scene that many a person is apt to rent DVD disc from Netflix for watching the favorite films since the subscriber can keep the rented movie as long as desired, but to rent a new movie, the subscriber must mail the previous one back to Netflix in a metered reply mail envelope. Upon receipt of the disc, Netflix ships the next available DVD disc in the subscriber's rental queue. But DVD discs are susceptible to all kinds of damage when they're not in their case. A single scratch can render a DVD disc unreadable by your player. In consequence, imagine if something unfavourable happened to your rental DVD disc-compensation for its damage would be an expensive proposition. And because of your portable device lack in hard driver, you can't play DVD disc on your iPhone iPad for watching on the go. In such case, DVD copy software serves as a bulwark against these troubles by allowing you to back up your Netflix rental DVD to iPhone iPad for on-the-move enjoyment as well as protect your rental DVD from being accidently scratched. That's quite a win-win solution, right? In a bit to back up your Netflix rental DVD to iPad iPhone or hard drive, a professional yet trustworthy DVD copy app is seemingly vital. Here humbly recommends you the ultimate Netflix DVD copy software - MacX DVD Ripper Pro, which towers over its counterparts in its mighty ability to rip and copy Netflix DVD to a single MPEG-2 file, backup Netflix DVD to MKV with top quality and even clone Netflix DVD to ISO image for your later DVD burning. Note: The software developer calls for ripping or copying Netflix DVD under the concept of Fair Use and does not encourage any illegal reproduction or distribution of copyrighted content. Please abide by the local DVD copyright law before doing it. Netflix Rental DVD Copy Tutorial-Show Time! Step 1: Free download and launch this Netflix alternative for DVD enjoyment app, and click the button of "DVD Disc" to load the content of the rented Netflix DVD. 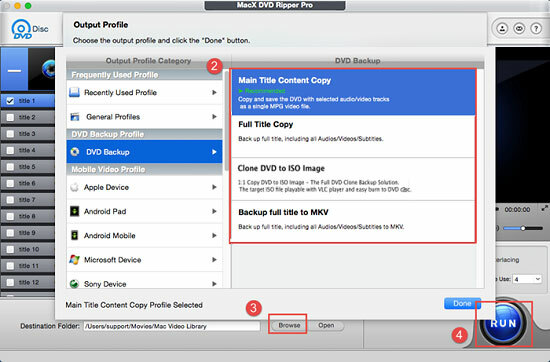 Step 2: Choose the DVD backup model in the subcategory of output profile with four choices for you to pick. It is better to make 1:1 copy from protected DVD to ISO image if you are intend to add this movie to your collections before you return it back to Netflix online store. Step 3: Click "Browse" button to figure out a destination folder to store the digital copy. Step 4: Press the "RUN" button to start copying Netflix rental DVD on Mac. Tips: No matter the rental DVD from Netflix protected by common CSS, Region Code, RCE, UOPS, or the higher Sony ARccOS and Disney X-project protection, this No.1 DVD copy program for Netflix is capable to unlock the copy protection tech easy as pie and lets you rip and copy Netflix rental DVD to your iPad (iPad Mini 4 Retina/Air 2), iPhone, Galaxy S9 edge/Note 9, PS4, Xbox One, Nokia, Blackberry, Sony, etc. just a click away. More information: Backing up Netflix rental DVD just the tip of the iceberg for this mighty DVD ripper, it can also make you wow at its infused 180 video and 14 audio formats profiles so that you can freely copy your Netflix DVD to any file format as you like, such as MP4, MOV, AVI, FLV, MKV, MP3, ACC, etc. for playback on any media player or handheld device.